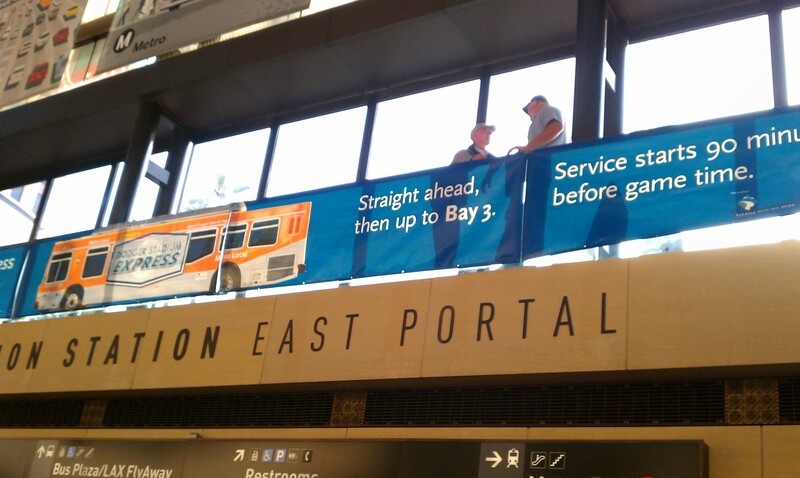 Workers ready the banner for the Dodger Stadium Express this morning at Union Station. Photo by Kim Upton. The Dodgers’ first home game of the season is tonight at 7:10 with an exhibition game against the Angels. The Dodger Stadium Express bus service between Union Station and Dodger Stadium also begins running this evening. •The bus is free for anyone holding a game ticket (the State’s Mobile Source Air Pollution Reduction Review Committee is picking up the tab). •At Union Station, the bus can be found at Bay 3 on the Patsaouras Transit Plaza on the east side of the building — the side facing Vignes Street. •At Dodger Stadium, the bus stops in the parking lot behind center field. •Buses begin running from Union Station to the ballpark 90 minutes before the game starts and through the third inning. Buses from the ballpark will run for 45 minutes after the end of the game. For more details, please visit the Dodger Stadium Express page on the Metro website (link is above). Metrolink has also added late-night trains from Union Station on the Antelope Valley, San Bernardino and Ventura County lines. More info is at metrolinktrains.com. Just include the link again. Be thorough. Give Metro a good name by caring just a little bit more. HTML Code is free. Fair enough. I was trying to avoid confusing readers by suggesting there were two different websites to visit for more info.